The Child Labor Poster is a child labor law poster by the Maine Department Of Labor. This poster is mandatory for some employers, including employers of minors. This poster must be posted in a conspicuous place where all employees will see it in any workplace where employers hire minors. This poster describes the restrictions minors have on hours they can work for both the week and each day as well as restrictions when school is in session or not in session. This poster also describes the qualifications minors must have to be able to work and how to get more information on Child Labor Law. It appears you don't have a PDF plugin for this browser. 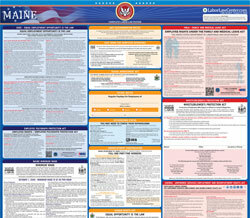 Please see the link below to download maine-childlabor.pdf. may work in most businesses, however not in hazardous jobs. Bureau of Labor Standards for details. • Superintendent of schools certify academic standing. but two during summer vacation. by Bureau of Labor Standards. •  Employer keeps Bureau-approved permit on file. Fair Labor Standards Act. For more information, contact the U.S.
•  No more than six days in a row. •  Cannot work before 7 a.m.
•  Not after 7 p.m. during school year. •  Cannot work after 9 p.m. during summer vacation. When School Is in Session  • No more than 3 hours on a school day, including Friday. session one or more days. • No more than 6 days in a row. •  Cannot work before 7 a.m. on a school day. •  Cannot work before 5 a.m. on a non-school day. •  No more than 50 hours in a week. When School Is in Session  • No more than 6 hours on a school day. •  On last day of school week, may work up to 8 hours. issued to employers who do not comply. (207) 623-7900. (The laws are also on the Bureau website.